N.W. van Ruiten B.V. is producing its own label called NVR since 1954. The NVR label consists a complete range of sweet and sour products in 2650 ml glass jars and in solid cans with a content of 10.5 litres. All NVR-preserves are meant for use in the catering industry. N.W. van Ruiten B.V. not only manufactures the label NVR but next to this range of products they also produce a small variety of private labels for their largest buyers. N.W. van Ruiten B.V also provides products for processing. Several manufacturers of e.g. 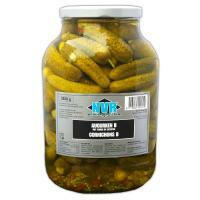 salads and pizza's have chosen NVR products to be a part their own product. Zeer fijne augurken in zoet-zuur azijn. Small gherkins in a sweet-sour vinegar. Medium-sized gherkins in a sweet-sour vinegar. 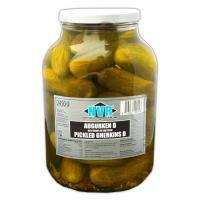 Large gherkins in a sweet-sour vinegar. 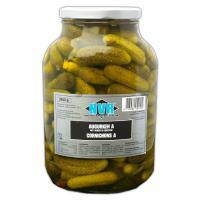 One tin contains 30 till 40 very large gherkins in a sweet-sour vinegar. 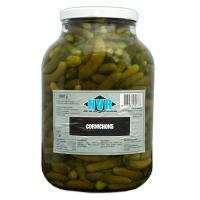 One tin contains 50 till 60 large gherkins in a sweet-sour vinegar. 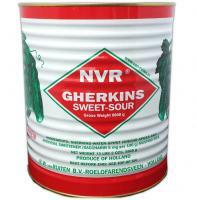 One tin contains 70 till 80 large gherkins in a sweet-sour vinegar. The cocktail gherkins are similar to the Pickled Gherkins D.